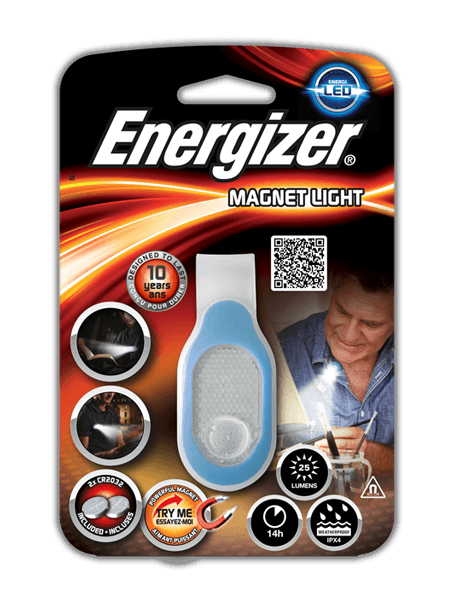 The Energizer® Magnet Light is an excellent wearable solution that integrates all the benefits of hands-free lighting. Featuring a strong magnetic fastening system, the light securely adheres to clothing, accessories or metal surfaces. The lightweight, water resistant design makes it highly portable and well-suited for outdoor use. The Energizer Magnet Light delivers an optimal balance of bright LED light output and long lasting runtime, which are easily accessible at the push of a button.